The Haws 1441 Drinking Fountain is a wall mounted barrier-free unit. Shall include a white powder-coated cast aluminum basin with integral mounting brackets, push-button operated valves with front accessible cartridge and flow adjustment, dual polished chrome-plated brass vandal-resistant bubbler heads, polished chrome-plated brass vandal-resistant waste strainer, vandal-resistant bottom plate, and chrome-plated 1-1/2" IPS trap. Perfect for either public or private settings, our cast aluminum series is a great fit for any indoor/outdoor environment. This unit is the perfect fit for high traffic areas where there is a greater need for multiple drinking stations. Powder-coated finish helps maintain the fountain's overall appeal so it always remains looking as new as it did when it was installed. Specifically, this type of wall mounted drinking fountain may be placed in settings such as: parks, schools, and other environments where the temperature remains above freezing. Heavy-duty cast iron bowl with a glossy white enamel finish is designed for the toughest of applications, and at the same time is gentle to all users with its soft rounded corners. Unit also ships with vandal-resistant bottom plates to provide added peace of mind. 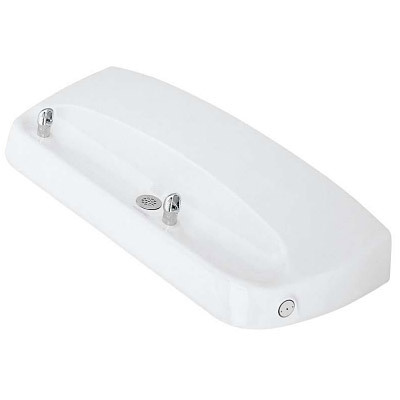 Low profile basin supports a dual bubbler head design to make it a great addition to high traffic situations. Gleaming white powder-coated finish is attractive and functional for any situation, and the soft rounded corners provide added safety and peace of mind. Model 6710 mounting plate for use with Haws model 1441.